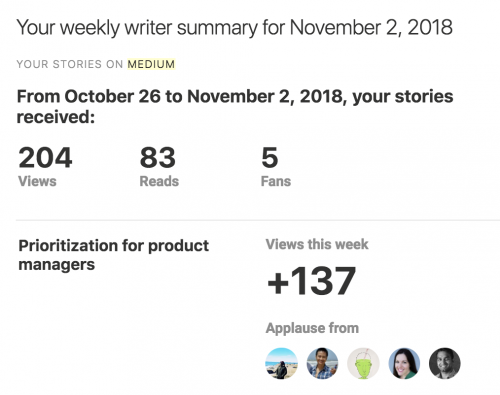 I saw that Medium now shows you sources of traffic. 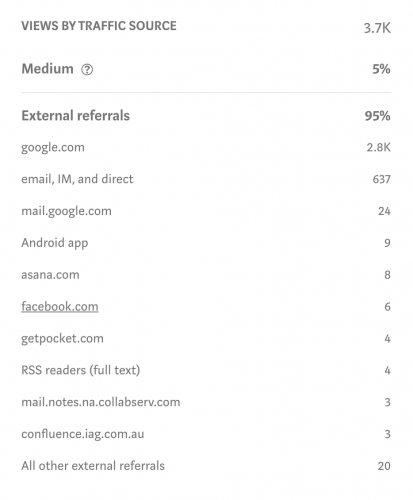 My hypothesis was that most of the traffic was driven from Medium, but its only 5% of the traffic. Sometimes above the organic results were paid search links, which means that people are bidding on it. So its clearly an important search term. I also thought about it some more. I was inspired to write a series of blog posts that explained the day to day real life of a product manager with simple easy to understand posts. They were intended to be transparent and explained the guts about product management. There’s clearly an audience for this type of writing. One of the most important things we do as product managers is “prioritize”. We choose between competing priorities. I’ve learned that using a criteria is really important that is tied to your strategy and mission. We have limited resources and must make the tough choices about what we pursue, hoping that we get the best return on investment. “Priotiziation for product managers” and its various combinations is probably a long tail niche search term. I mean how many product managers are there in the world? For every 10 engineers there’s probably one product manager in a team. Atlassian is a product company with roughly 3,000 people and 150 product managers. This is 5% of the workforce. Specific products designed for product managers and advertised to them would also small. However, the product manager role is highly leveraged given the ratio I mentioned. Its important because of the product manager’s responsibility to lead the product strategy, roadmap, and ultimately prioritize. If you’d like to read the article please go here to read it on my blog or check it out on medium. 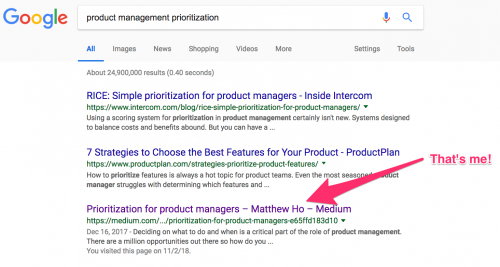 According to myself and 4,000 other people that have visited the blog, they seemed to like it 🙂 Overall, I’m pretty happy with ranking 3rd for the google search result for “Prioritization product management”. I’ll do a lil dance (shoutout to shiggy) for this small win and then go enjoy the weekend! Its definitely inspired me to keep writing, given that I had a lot of ideas but haven’t had the time to put my fingers to the keyboard.